Wheelgate Park isn’t the most obvious of venues for an escape room. With a Robin Hood theme, I assumed they’d be aiming squarely at the children’s market, but it turned out that’s defitnitely not the case: these are very much aimed at teenagers and adults. If anything, they’re probably more difficult than your average games. Unsurprisingly given the location, there’s plenty of parking, but it’s worth pointing out that you may have to park a fair walk across grass to get to the venue if you’re there on a busy day and that the toilets are inside the main park. We found it particularly frustrating that you had to have one of the park attendants accompany you if you needed the toilet, which made me feel a little like a naughty schoolchild. I realise why they do that but, when you’ve already been sent out of the reception to find the facilities, it adds insult to injury. Finally, it’s not the warmest of environments so, if you head over in winter, make sure to take something to wrap up in! 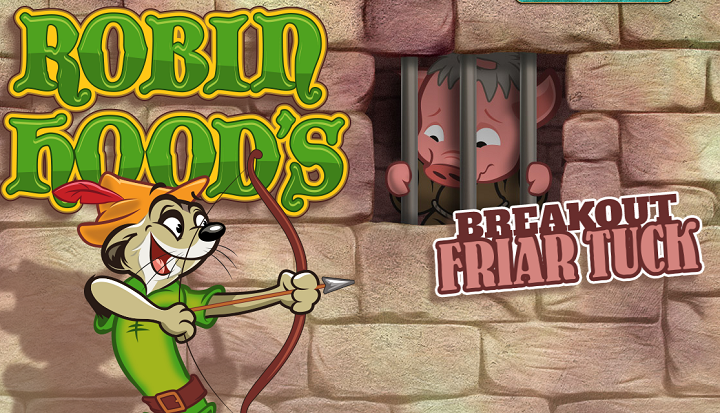 Robin Hood is a fun, well decorated game that’s starting to show a little sign of ageing. As an experience likely to attract some relatively young players, there should probably be a warning that they shackle you at the start, even if it’s only for a short while. Once you’re on your way, though, it’s a fun romp through the room, with searching, several physical puzzles and some more traditional puzzle-solving. As a team of two, we found the search element a little excessive, especially one observation puzzle which required us to note a level of detail that we just didn’t have time to see. The physical puzzles were where this game stood out, with a couple of cool interactions which will stick in your memory and one very involved puzzle that had the potential to be a real centrepiece for the game. Unfortunately, it was worn to such an extent that it took us several minutes of painful interaction to attempt a solution. The wrong solution. Twice. Eventually we took a clue, not because we’d run out of ideas but just because it was becoming physically painful to continue. This wouldn’t have been as bad with a larger team but, fundamentally, it was down to poor maintenance. Another physical puzzle was incredibly thematic but just didn’t work – either because it was always a bit flawed (which seems likely) or because, again, the equipment was worn out. In that case there was a workaround, but it took what little fun there was out of the puzzle and left us with the feeling of having cheated. That’s a shame, because it really would have added to the game and given extra enjoyment for those who prefer dexterity challenges to mental hurdles. We thought that Robin Hood was pretty, but Molly O’Grady’s was a step up. There’s a beautifully portrayed bar scene to start the experience and, while the game varies in quality, it’s certainly never poorly decorated. Some teams never make it near the end, which is a real shame because, in spite of how good the start looks, the final stage is probably one of the most memorable visuals I’ve had in an escape room. There’s also a real sense of exploration within the game, both physically as you move through the space and also as you start to uncover the story behind the protagonist’s disappearance. This game is packed with puzzles. Possibly even too packed, because we felt overwhelmed with things to solve, frequently finding that we were working on incomplete puzzles. If you want physical challenges, then Robin Hood is probably a better choice, but this game comes with a few impressive physical interactions, including a couple of creative solutions that brought a smile to my face. There’s plenty of variety on show and, while the puzzles were mainly tropes, they almost always had logical solutions. The main criticism we had was that it was often unclear which puzzle we should be working on or we required a particular interpretation to give the answer they were looking for. It was never an entirely unreasonable one, but it was nonetheless something which left sufficient ambiguity to make us uncomfortable. A great example was the penultimate puzzle, which took exactly the same type of input as the last puzzle of the game. Since we’d got a viable solution, we repeatedly tried to make use of it, missing out on a key piece of feedback that would hint at the fact that we were solving things incorrectly. That left us with a sour taste in our mouths as the clock ran out and our GM explained what we’d been doing wrong. In truth, though, this game beat us fair and square. There’s a huge amount to get done and we just didn’t move quickly enough to leave us time at the end to solve it all calmly. Our team of two failed the room having taken five or six clues. It’s pretty, there’s a good sense of exploration and it’s got fun puzzles so, if you are in the area with a larger group, I’d recommend heading along.